Ellie Simmons, left, and her sister Katie Simmons collect sap at Simmons & Daughters Sugar House in Morrill in this Feb. 28, 2018, file photo. 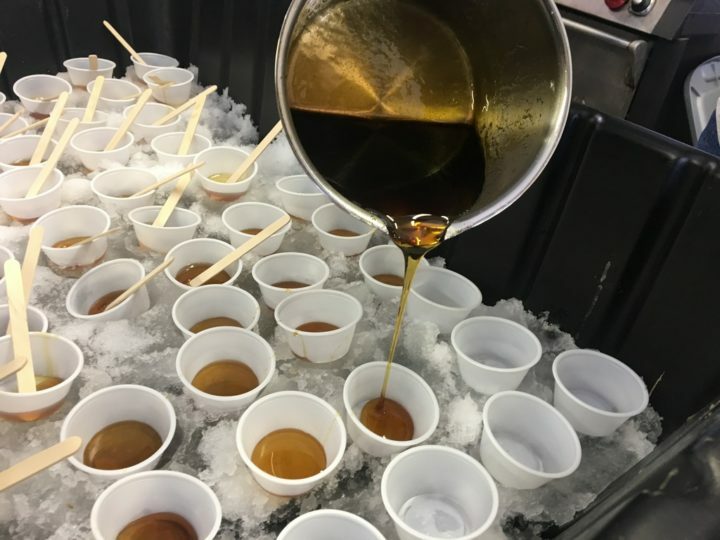 Maine’s official day of celebrating sweet, sticky maple is almost here, and producers around the state are getting ready for enthusiastic crowds of maple syrup fans. Josh Knipping of Back Ridge Sugar House in Winterport said Saturday that he had already welcomed scores of people to see his sugarhouse and to sample maple syrup, maple popcorn, maple whoopie pies, maple ice cream made by Spencer’s Ice Cream of Bradley and much more. Maine Maple Sunday and other events make for a busy weekend, but it’s one the maple producer looks forward to every year. 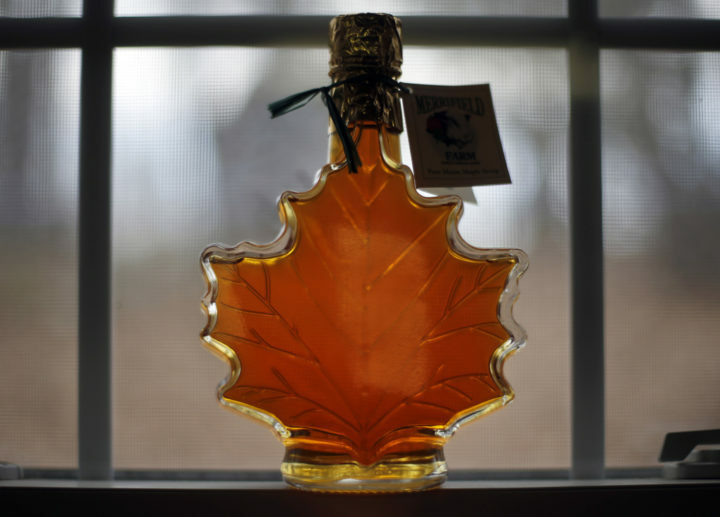 In this March 9, 2016, file photo, a bottle of maple syrup are displayed at the Merrifield Farm and Sugar Shack in Gorham, Maine. Sugarhouses around the state are open to the public this weekend, and in many places activities are scheduled for both Saturday and Sunday. Farms that participate in the maple syrup bash provide tours, music, activities and lots of maple-flavored treats. The event celebrates Maine’s official sweetener and takes place every early spring. This year is off to a slow start, Knipping and other maple producers have said. Arnold Couture, not pictured, pours fresh maple syrup taffy into cups for Maine Maple Sunday guests at the family-run Maple Valley Farms in Jay in this March 25, 2018, file photo. But on Saturday, he said that the sap was running, a delicious portent of spring. “You’ve got to make hay while the sun shines,” he said. The Maine Maple Producers Association has an online map of sugarhouses that participate in Maine Maple Sunday and other weekend activities, stretching from Aroostook County in the north to the far southern tip of the state. Some of those producers include Nutkin Knoll Farm and Sugarworks in Newburgh, Cider Hill Maple Farm in Exeter, Pop’s Sugarhouse in Ellsworth, Kinney’s Sugarhouse in Knox and Simmons & Daughters Sugarhouse in Morrill.